Isn't it great to stay healthy as you save lives? The Philippine Red Cross (PRC) has announced the 2nd Red Cross Million Volunteer Run (MVR) this coming February 10, 2013 which will be held simultaneously in Metro Manila and other key Philippine cities. The first MVR was held in year 2011 and after almost 2 years, I'm glad the second one is here to celebrate Volunteerism. Seeing our nation in disasters and danger for the past years and watching volunteers who readily give their time and effort to help people in need, I can't help but salute them, so does the MVR 2 does, to salute the heroes for the past years! According to PRC Charmin Richard Gordon: "We will yet forge an aspect of our national identity as that of belonging to the foremost volunteer country in the world!" Participants 17 years old and below must have secure signed Parental Consent Waiver Form must be signed to qualify for registration. You may bring your Multiply Original Invoice which is also considered as Official Receipt as Waiver. All volunteer participants must complete the MVR Registration Form honestly and accurately. 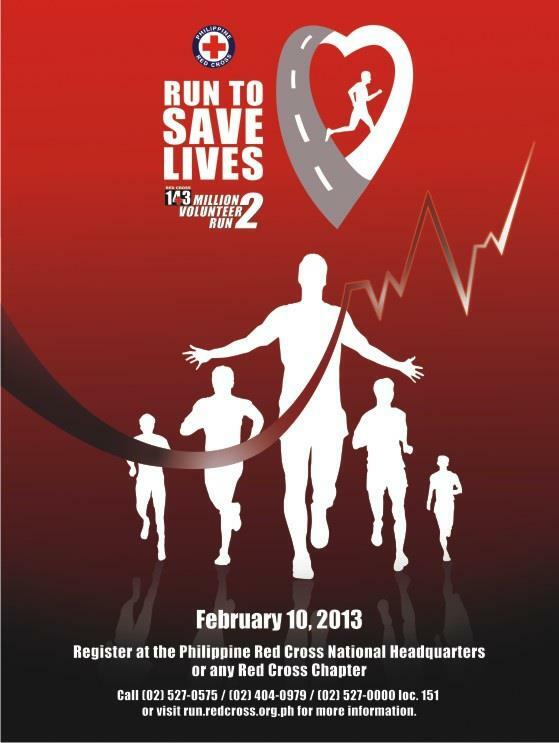 Run date is on Sunday, February 10, 2013. For Metro Manila, starting point for 3k will be at CCP (in front of Aliw Theater), 5K will be at Global Gutz (Jose Diokno St. Near World Trade Center). Finishing points for both categories will be at the QuirinoGrandstand. Race points for provincial runners will be announced later. Assembly time will at at 5:00am. Gun start will promptly be 5:30am for 3K and 6:00am for 5K. All participants must wear RED shirt. Participants may run, walk or rest upon their discretion.